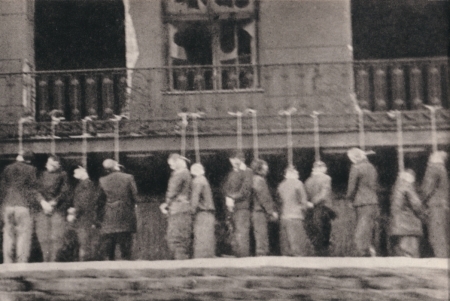 The demonstrative public hanging this day in 1944 of Poles in the remains of the Warsaw Ghetto* was little more than an everyday atrocity in Nazi-occupied Poland — although, ten days after the gauleiter responsible for previous mass executions had himself been assassinated by the Polish Home Army, it presumably had an extra bit of meaning for the city’s denizens. Nazi terror reached new heights for the non-Jewish population of Warsaw in the winter of 1943-4. People were seized at random in the streets and executed on the spot; between October and February some 270 to 300 men and women were publicly hanged or shot each week — the kind of atrocities the French commemorate in Tulle and Oradour were, in Warsaw, a part of daily life. ‘On my way to Leszno Church today,’ Julian Kulski, a young soldier of the Home Army, recorded on 11 February 1944, ‘I saw a crowd of people standing in front of the Wall. They were gazing at something above the Wall, on the Ghetto side of it. As I got closer, I could see for myself — hanged from the upper-storey balconies of what had been an apartment house were the bodies of twenty-two of our Freedom Fighters.’ Kulski, at any rate, took them for Freedom Fighters. This blurry photo dated to the same day and location was taken from a moving tram. This mass execution may also be one alluded to by Jewish resistance fighter Yizhak “Antek” Zuckerman,** who survived the war in Warsaw with false papers identifying him as a Pole. His A Surplus of Memory: Chronicle of the Warsaw Ghetto Uprising remembers such an execution occurring while they lived on Leszno Street after the ghetto’s destruction — and that it greatly upset his wife, Zivia Lubetkin, because Zuckerman was so late arriving home that day. One day the Germans hanged fifty Poles on street lamps, something they often did. This time it was on Leszno Street, in retaliation for harassing Germans. In such a case, they would take fifty Poles from their “stock” in Pawiak, publish their names, add the crime for which they were being murdered, and hang them in the city on electric poles. In this case, they also strung people up on the outside walls of the ghetto, where there was still a wall, even though there was no longer a ghetto. * Warsaw’s Jewish ghetto had been liquidated the previous spring; at this point, it was rubble behind the still-standing wall. ** Zuckerman also appeared as a witness in the Israeli trial of Adolf Eichmann. You know, while we’re at it why don’t we dig up the grave of Hitler’s father to find out whether he was really half-Jewish or not, which would make his son Adolf a Jew by Nazi law. Hmm? Let’s find out for sure, and make sure that if Adolf really was one-quarter Jewish, everyone will know it. Thank god we have genetic tests now so Jews like Yizhak “Antek” Zuckerman wont be able to pass as anything other then a Jew. Now we just need a a new Hitler and it is game on!. The Germans made it a habit of adding murder to just about every location their troops invaded. Not only did they murder 6 million innocent Jews, but they slaughtered an additional 5 million folks who just happened to fall in to the category of people they wanted dead. As such, it left them little room to complain when we (the US and the Brits) turned their cities into rubble, or the Russian terror which came from the east.